Limestone funerary stele (shaft) surmounted by two sphinxes, last quarter of the 5th century B.C. Elegant sphinxes are positioned back-to-back with their heads turned so that they could be seen in three-quarters perspective. The calm beauty of the creature's head, the form of the palmettes, and the egg and dart molding that decorates the base of the platform are typical of Greek art of the fifth century B.C. Date: last quarter of the 5th century B.C. Cesnola, Luigi Palma di. 1885. A Descriptive Atlas of the Cesnola Collection of Cypriote Antiquities in the Metropolitan Museum of Art, New York, Vol. 1. pl. CXXVI.920, Boston: James R. Osgood and Company. Perrot, Georges and Charles Chipiez. 1885. Histoire de l'Art dans l'Antiquité. t. 3, Phénicie, Cypre. p. 215, fig. 151, Paris: Hachette. Myres, John L. 1914. Handbook of the Cesnola Collection of Antiquities from Cyprus. no. 1413, New York: The Metropolitan Museum of Art. Tatton-Brown, Veronica. 1986. "Gravestones of the Archaic and Classical Periods: Local Production and Foreign Influences." Acts of the International Archaeological Symposium "Cyprus between the Orient and the Occident" : Nicosia, 8-14 Sept. 1985, Prof. Vassos Karageorghis, ed. p. 443, pl. XLVII.6, Nicosia: Department of Antiquities of Cyprus. Karageorghis, Vassos, Joan Mertens, and Marice E. Rose. 2000. 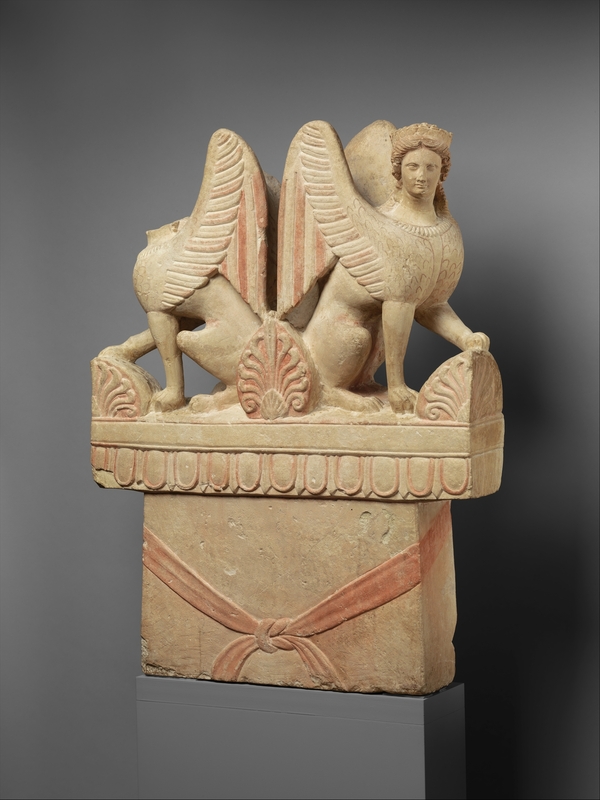 Ancient Art from Cyprus: The Cesnola Collection in The Metropolitan Museum of Art. no. 346, p. 216, New York: The Metropolitan Museum of Art. Lightfoot, Christopher S. 2000. "The New Cypriot Galleries at The Metropolitan Museum of Art." Minerva, 11(3): pp. 20–21, fig. 13. Pogiatzi, Elena. 2003. Die Grabreliefs auf Zypern: von der archaischen bis zur romischen Zeit. cat. 16, pp. 114–15, pl. XI, Mannheim: Bibliopolis. Hermary, Antoine and Joan R. Mertens. 2013. The Cesnola Collection of Cypriot Art : Stone Sculpture. no. 470, pp. 337–38, Online Publication, New York: The Metropolitan Museum of Art. Karageorghis, Jacqueline. 2014. "À Propos Du Sarcophage D'Amathonte." Cahier du Centre d' Études Chypriotes , 44. pp. 391–93, 396, fig. 4, n. 29. Karoglou, Kyriaki. 2018. "Dangerous Beauty : Medusa in Classical Art." Bulletin of the Metropolitan Museum of Art, 75(3): p. 28, fig. 39. Limestone funerary stele (shaft) with a "Cypriot capital"
Artist: Date: 5th century B.C. Artist: Date: mid–1st century B.C. Artist: Date: early 6th century B.C. Artist: Date: late 4th century B.C. Artist: Date: ca. 530–520 B.C.